This is a one stop resource for smart guinea pig owners to give you everything you need to know about basic guinea pig care. Ensuring your guinea pig is well looked after is vital to making sure they live a long time, and so at Online Guinea Pig Care you will find a wealth of articles and information about how to care for your guinea pig. There are many different blog posts about all kinds of subjects around Guinea pig care. Check out the recent posts section to the right. Guinea Pig Breeds. Here we look at the different breeds of guinea pigs around the world. Nature and character of guinea pigs. We look at its size, sounds, sight, its nature, what they are like, hearing and a whole lot more. Choosing a guinea pig. Here we look at where to go to get a guinea pig, making a choice, how many to have, quarantine, taking the guinea pig home and more. 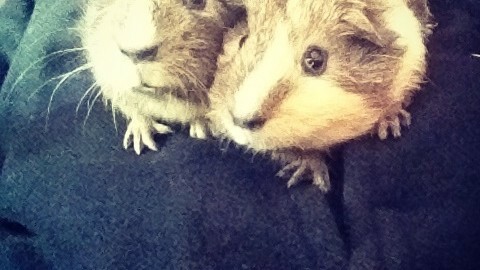 Guinea pigs and other animals. Here we look at the relationship that guinea pigs have with other animals, especially those that are also household pets. How to feed your guinea pig. Looking at the best ways of feeding a guinea pig, different techniques, and things to use. Guinea pig foods. Here we look at every possible food your guinea pig eat. We discuss its suitability, its tastiness for the guinea pig and whether it should be welcomed or avoided. How to care for your guinea pig. Here we look at providing daily care for your guinea pig, weekly care, health, waste disposal, routine care, what to do in emergencies and more. Making a home for your guinea pig. Here we look at the hutch, location, size, what run to use and much more. Where do guinea pigs come from? We look at the origins of guinea pigs, evolution, and history. Online Guinea Pig Care is a site for all guinea pig owners to give help and support. If you have any comments, suggestions, criticisms or just want to reach out then contact me here. Hi Emma, I usually get a friend to look after them and brief them well  I try and make sure that they are at least checked on once a day if Im away, I know that they could go longer if they need to and have enough food, but I don’t like to leave them too long. How do I keep my guinea pig warm at night? You can always make a tunnel for them out of fleece or over their cage with a curtain blanket if they’re kept outdoors. I wouldn’t recommend a heater in case it ever glitches or anything if unsupervised. Hope you’ve found that helpful. We have found that warm water Bottles wrapped in a towel works quite well and they love it. Just be carful not to make it too hot. Oh and be warned they love the warmth so much that they do their business right there and then . So change the towel every time you change the bottle . You can fill a petbottle with warm water end then put a sock on it so the piggie dont go burn himself but can cuddle upp near it to stay warm .also i use a tshirt or a cloth i was gonna throw anyway so he can have it as a tent by the bottle to get cosy in. I am really worried about my guinea pig. I have notice that he is breathing hard and also that he sneezes. I have read articles about respiratory. I haven’t noticed any green reaction in his nose nor under his eyes. He eats just fine, and has his normal routine.